The knee joint is the point at which the femur bone of the thigh meets the tibia bone of the lower leg. All the components of the knee - bones, cartilage, synovial membrane, ligaments, tendons and muscles - must work together properly for the knee to move smoothly. Cartilage is a protective cushioning that keeps the bones from rubbing against one another. In a healthy knee, a thin, smooth tissue liner called the synovial membrane releases a fluid that lubricates the knee, reducing friction as the bones move. In an arthritic knee, the cartilage between the femur (thigh bone) and the tibia (shin bone) gets worn away, causing the two bones to scrape against each other. When this happens, the joint can become pitted, eroded and uneven, often resulting in pain, stiffness and instability. While this type of arthritis damage often happens throughout the entire joint, for some patients it can be localized in a single compartment of the knee. If the damage is localized to a single compartment, treatment with partial knee replacement may be an option. 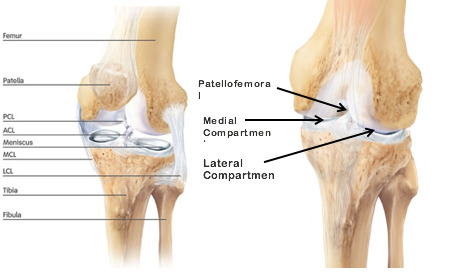 Because partial knee implants only replace the damaged bone and cartilage of the medial, lateral or patellofemoral compartment of your knee, the rest your natural knee's structure is retained.